[Giveaway has ended - thank you to all the participants!] 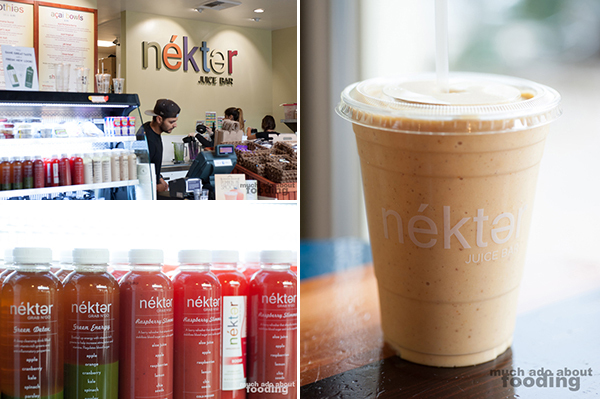 I remember that my first impression of Nekter Juice Bar was, "Wow, they are everywhere," and this was apparently only during their first year. The company only recently celebrated its fourth anniversary but already boasts nearly 50 locations across 5 states, the majority of which are in southern California where it was founded. Blame the health craze that has been sweeping the nation; as people seek to reverse the damage their bodily neglect as done, they have taken to juicing and indulging in fruits and vegetables. Nekter launched in a beneficial time for growth in this area. I have always been a huge fan of juices in general but never considered juicing. What I didn't realize was that Nekter also carries several different products that would easily make me a repeat visitor like their acai bowls...yum! 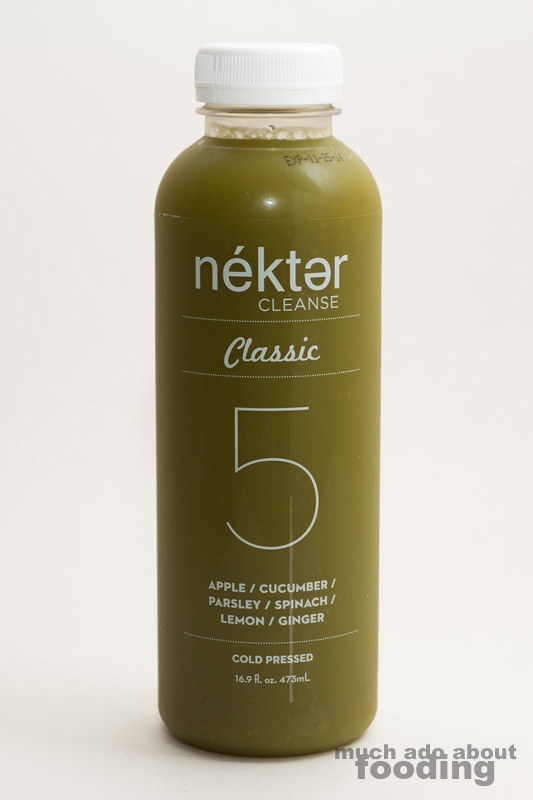 Their juices follow the cold press method, and a big part of the company's draw is their offering of a juice cleanse. We initially had gone in to try out their juices, smoothies, and acai bowls but my curiosity got the best of me. 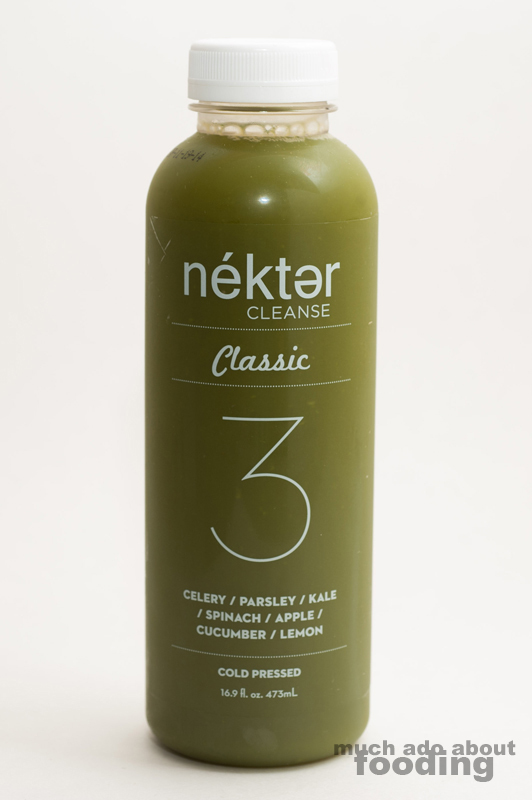 I wanted to challenge myself to do the cleanse, and Nekter agreed. Check out my three-day journey on their Classic Cleanse and maybe you'll figure out if it's something you'd do too! First things first, I immediately would say that you should consult your doctor and know your health condition before you attempt to do something of this nature. It is not a weight loss program. The cleanse is meant to reset one's body and physical system to (hopefully) get on track to adopting a healthier lifestyle. 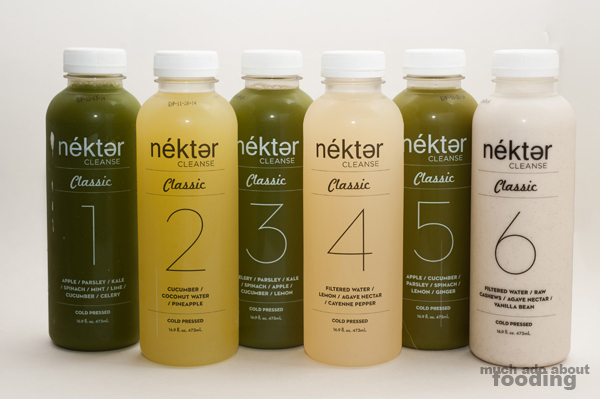 Nekter's consulting nutritionist has helped balance out the day's consumption to include all of the necessary vitamins and nutrients needed in a day; this translates to six bottles of juices (15 pounds' worth of fruits and vegetables) per day. 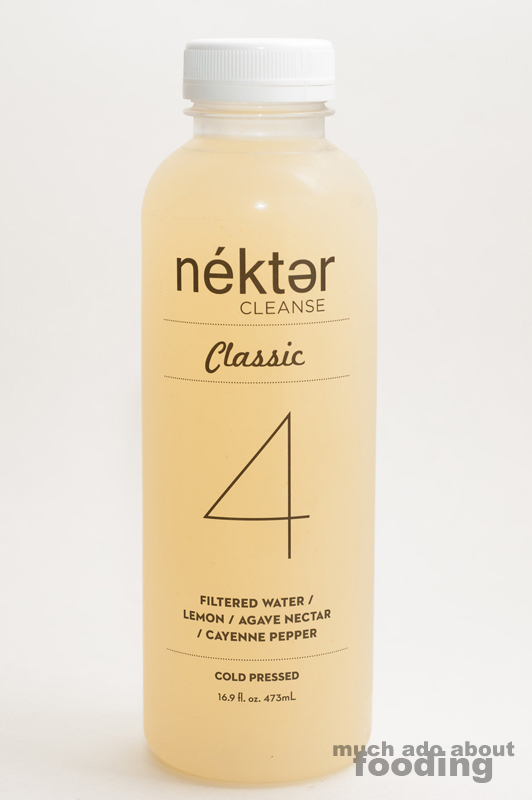 There is the Classic Cleanse ($48-$240) for first-timers or novice cleansers and the Advanced Cleanse ($48-$240) for the veterans. Both can be tried out in 1-day, 2-day, 3-day, and 5-day durations. I opted for the recommended 3-day length. TO PREPARE, one should ease one's self into the cleanse by eating more fresh vegetables, fruits, and lean proteins. There should be prepwork. I want to say that silly ol' me had pastas and burgers the day before (for the blog, I swear!) but luckily, I generally eat well so the transition into the cleanse was not too bad. My Day 1: Not bad because I already like green juices. You'd have to like green juices as well to begin the cleanse with a good start. It is definitely heavy on the vegetable taste but not unpleasant. There is the barest hint of sweetness from the apple. My Day 2: I woke up starving. However, the moment I started sipping this bottle, the hunger pains went away. Again, there is a slight sweetness that helps this drink go down for those unaccustomed to kale-based juices. I was also quite queasy when I woke but after drinking this Bottle 1, I felt fine. My Day 3: Again, I woke up so hungry but one sip calmed my stomach. I wonder what in this makes it have that effect! 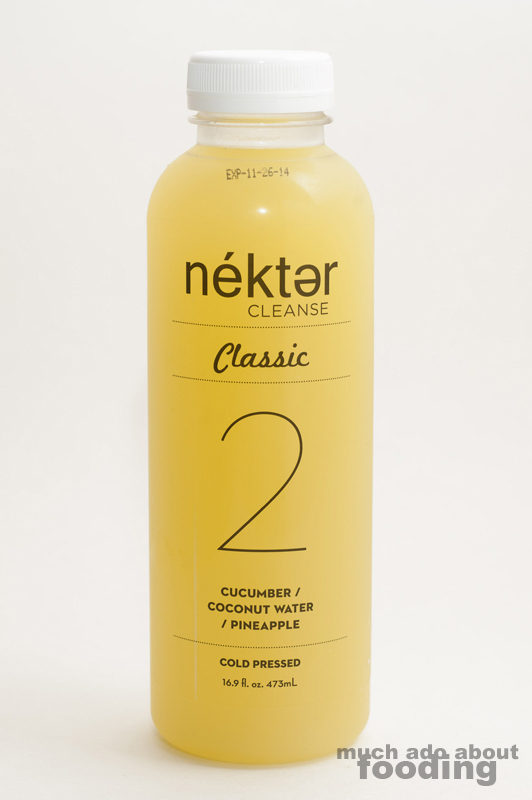 This has a great taste for any day, even if not as a cleanse drink. I was very alert this morning once I had Bottle 1. My Day 1: SO good. The first taste of this Bottle 2 had me hooked. The coconut water added a very different change of pace from the green Bottle 1, and the cucumber made it extremely refreshing. I even shared a sip with Duc who then wanted more of it. This was so pleasant to drink that it was gone in just a minute or so. It's probably why I got hungry faster for the next bottle. My Day 2: Still a great bottle yet the effect was not as strong in terms of tastiness as the previous day. The pineapple gives a tinge of sweetness to it but also makes this similar to a very watered down pina colada without the alcohol. I think the cucumber and coconut water mix needs to be done more often. 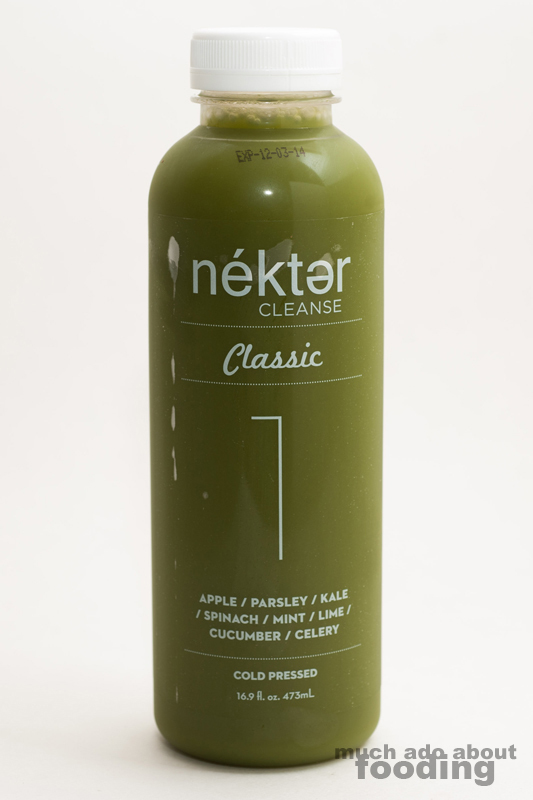 Nekter Description: Indulge in this alkalizing blend of green veggies to stimulate antibodies. A burst of lemon is a natural antiseptic to help zap toxins. My Day 1: I have no idea why but this is THE WORST. Drinking the bottle was like drinking soy sauce in terms of taste and aftertaste. I chugged this down to get it over with as soon as possible but did not understand why it tasted so awful to me. My Day 2: This time, Bottle 3 is colder than before but it still is pretty awful in taste to me. I have a suspicion that it is the amount of parsley used because I can't stand the taste of too much parsley. I'm not hungry by the time I get to this bottle but I sure am hoping for something more tasty. My Day 3: I drank the bottle straight from the fridge so that it was as cold as possible. The soy sauce resemblance is nearly non-existent though traces of it still linger. It is definitely more palatable chilly but still also definitely the worst (to me) of the lot. My Day 1: Bottle 4 is extremely tart and left my mouth feeling so dry. It tastes just like a spicy lemonade which makes it easy to drink down. My Day 2: I'm hungry by the time I get to this bottle so I try to drink it quickly; the cayenne makes that a little difficult but that's good. I shouldn't be drinking it so fast anyway. The lemon part is still tart but now much more manageable. I am more accustomed to the lemonade part of it. For the entire day, this ended up tasting the best as I was cleansing. My Day 3: With my teeth feeling funny, this drink all of the sudden becomes weird to have. The pepper seems to accentuate the odd teeth surface sensation. The taste is still akin to a refreshing lemonade though so I don't have much of a problem drinking it down. My Day 1: This is the third green juice of the bunch and probably the tamest. The ginger makes it enjoyably spicy (just a bit) and the apples do keep it sweet. I also think that the cucumber balanced out the strength of parsley. My Day 2: Still a sweet and spicy drink that makes the end to the main juices easy for me. I like how this hits both those categories of taste because it is a big difference from the previous tart and spicy. My Day 3: It is definitely a good one to extend in the time you need to drink it because it is pleasant both extremely cold and just chill. I have ended up, timing-wise, drinking this on the way home from work and it keeps me awake and energetic for the rush hour traffic. I attribute that to its slight kick from the raw ginger. 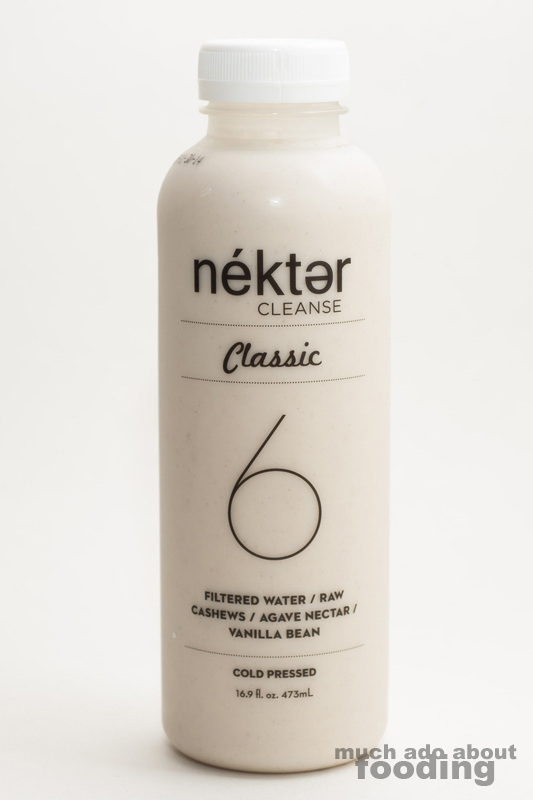 Nekter Description: A sweet dessert drink before bedtime to calm and soothe muscles with plenty of protein and minerals that aid the lymphatic system. My Day 1: Whoa, this is tasty. It is thick like a milk and gritty from the raw cashews. I first noticed just how many vanilla bean flecks there were. This is definitely a vanilla, heavy drink that reminded me of a thicker, creamier almond milk. I had heard that others picked Bottle 6 as their favorite; I can see why. The whole drink just feels good. My Day 2: The impact of drinking this is not as strong as the night before because I now know how it tastes. However, it is still good. My stomach is grumbling for food but the thickness of Bottle 6 helps calm it down a little. My Day 3: The final drink! Again, the effect is not as memorable as the first try but it is still a great way to wrap up the cleanse because it has texture to it. The other drinks were juices but this one actually has some grittiness to let you know it exists in some realm! It is recommended to ease out of the cleanse by incorporating food categories one at a time and solid foods slowly. I tried to come back with some steamed zucchini, rice, and just one dime-sized slice of Chinese sausage. The oddest thing was that just the smell of the sausage made me feel like I was about to throw up. When I took a bite of it, I very nearly did! The queasiness seemed nearly unbearable, and I think that is just from the fact that it is so different from the previously large quantities of whole vegetables and fruits. Animal-based protein was not anything my body was ready to accept just yet. How's that for a kickstarter to get you onto a healthier lifestyle path? I bet I could have gone vegetarian right after the cleanse! I also did not have as big of an appetite the days after the cleanse. I must emphasize this is not a weight loss program. It is about detoxifying so don't expect rapid weight loss. You must drink a lot of water. I did not expect to feel dehydrated considering the bottles were all juices but I did. I was thirsty all the time. Your bathroom visits will be frequent and quite a bit less...solid...than you're used to. Be aware of where you'll be during the days of your cleanse! The last day, I needed less bathroom breaks. My teeth felt disgusting by the middle of the second day. I realized it was because chewing on solid foods would naturally rub the tartar buildup on the teeth (similar to a dog's need for chew toys for dental hygiene) even with brushing twice daily. Constantly drinking liquids for meals made my teeth feel like they were never brushed. Headaches can happen. I got minor headaches the first day but they were gone the next two days. I did not feel hungry that often but my stomach did growl and "talk" all the time. I was not physically tempted to eat but just mentally. As a constant snacker, the rule of drinking a bottle every 2-3 hours worked out for me but if it doesn't for you, Nekter does provide ideas for how to get some solid foods in without hurting your process. I always felt nutritionally fine. I am prone to feeling faint if I don't get enough to eat in a certain amount of time but I never felt that way even though I wasn't eating solid foods. I felt faint the day after the cleanse because I wasn't filling up on all the right stuff. I feel more inclined to whole foods and a fitter lifestyle now that I've seen what 15 lbs of vegetables and fruits per day can do! 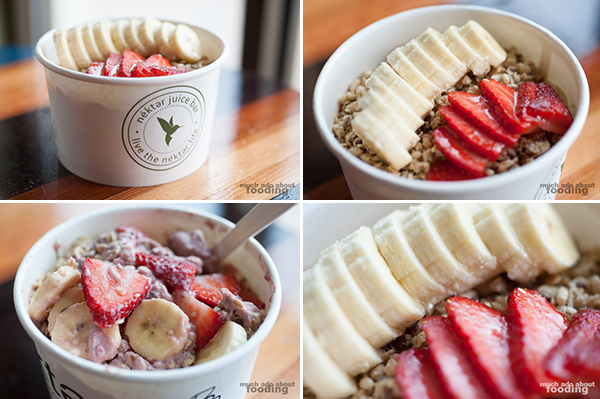 Prior to trying on the cleanse, I went in to check out Nekter in general and loved the acai bowl. They also offer Grab-N-Go bottles of juices for the on-the-go person. Everything is made fresh and as naturally as possible there so you can bet you'll get some healthy goodies. Though they do emphasize the cleanse in a lot of their marketing, it is not the only thing you can get it. I'm pretty glad I did the cleanse to see what it would feel like. It also made me crave healthy foods during and afterward which is good. I expected that I would want to eat the greasy stuff because I was being denied it but luckily, my body went the other way! Overall, not a difficult a challenge but definitely one that I'd have to plan out better to take on if I did again. Have you ever done a cleanse? How did it feel? Nekter has graciously offered the chance for one of my readers to win $50 toward any Nekter purchase. If the holidays have got you ready to experience a cleanse or you just want to taste some delicious healthy foods, enter below! The giveaway will run until 12/10/14 at 11:59pm PST. Winner will be contacted upon winning and has 48 hours to respond before a runner-up winner is drawn. A very honest and interesting post! 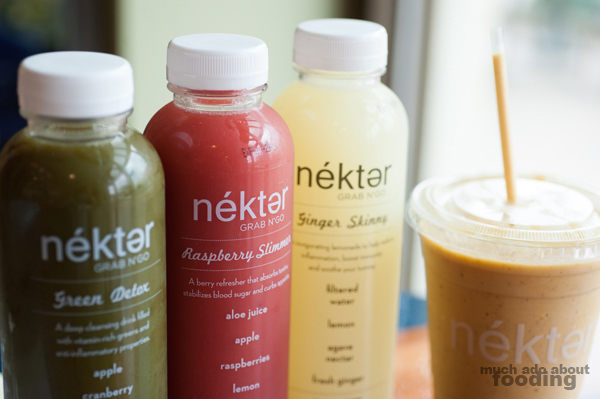 I love this article and i really love Nekter juice. I will do a juice cleanse using these juices next month.